Page 16-2: The first column, second paragraph should read: “Shown below is the 1926 to 1928 cone compared to the 1930 and later cone. 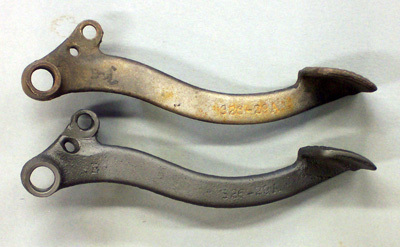 Page 16-60: The discussion regarding 1929 footbrake lever #2956-29A at the top of the page should mention the difference between the lever used on the 45" twin and that used on the 1929 single models. 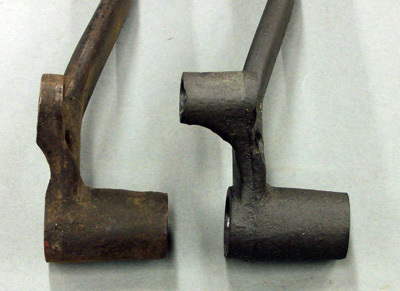 When compared side-by-side, the two levers look identical and both have the same "326-29A" casting number. However, looking at the rear end of the levers where the rear brake rod connects, we see that the lever used on the single models is much narrower than the lever for the 45" twin.